Can Wall Street Do Basic Math? It’s a chart showing the deterioration of major bank market caps since 2007. Prepared by someone at JP Morgan based on data from Bloomberg, this chart flashed across Wall Street and the financial world a few days ago, filling thousands of e-mail in boxes. Putting a face on the current banking crisis it really brought home to many people on Wall Street the critical position the financial industry finds itself in. Too bad the chart is wrong. It’s a simple error, really. The bubbles are two-dimensional so they imply that the way to see change is by comparing AREAS of the bubbles. But if you look at the numbers themselves you can see that’s not the case. Take CitiGroup, for example. 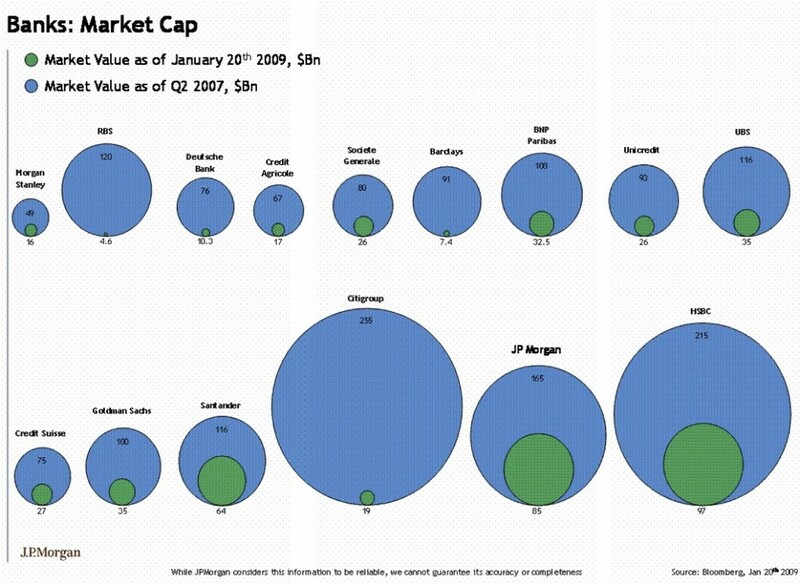 The CITI market cap dropped from $255 billion to $19 billion — a difference of 13.4X. If we’re really comparing the areas of the bubbles, that means 13.4 of those tiny CitiGroup-of-today bubbles should precisely fill the big CitiGroup-of-the-good-old-days bubble. Only they won’t. As a matter of fact it would take about 13.4 times as many little bubbles to fill the big bubble as the chart preparer thought or 179.64 little bubbles. Pi r squared, remember? This is because the intended comparison wasn’t two-dimensional but one-dimensional — the chart maker was intending we compare the DIAMETERS of the bubbles, not their areas. My first read of this is that comparing height (i.e., bars rather than circles) would be accurate. Circles won’t work due to the squaring, where as diameters do not bring in a factorial change. 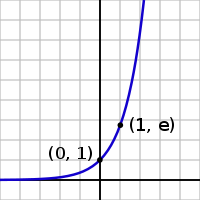 That’s what creates the exponential rather than arithmetic change in the circle’s area. I don’t have the original data, and I am wondering if this might be a simple Excel charting error. If anyone has either the Market cap data handy, or wants to pull the teeny data from the chart onto a spread sheet, please email it to me at thebigpicture-at-optonline.net. Alternatively, if you can design a more informative/accurate graphic, please send that along . . .
2 Responses to "Can Wall Street Do Basic Math?" JPMorgan did send out an updated graphic when they realized this error. I’ve seen it and I am sure its floating around the net somewhere. The only problem is that this chart is far more eye-popping, and hence turns up in all google searches.